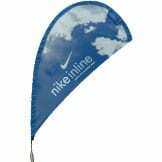 The innovative design of the flying banner’s unique shape allows it to cut through wind and rain and remain standing firm. 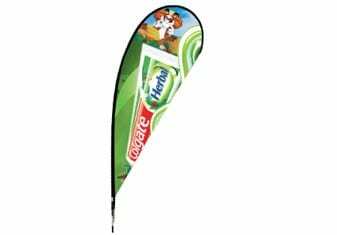 Its original design has been further enhanced to also allow for double sided versions ensuring your message can be seen from either side meaning text reads correctly whichever way you look at it. It is perfect for indoor and outdoor use and comes supplied with a ground stake for soft ground as standard with optional additional hardware to make it free-standing on other surfaces. Weight range from 0.3kgs to 5.0kgs from Micro to X-Large. Double sided versions are available in all sizes. 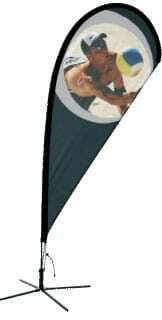 Replacement flags can be purchased without the need to purchase new hardware.